Magic is often contained to fairytales; considered something only children believe in, but step into the warm glow of the reflection pools at Villa HG HAR on a peaceful Caribbean night, and you might just believe in magic yourself. 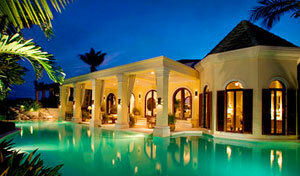 Recently added to WIMCO’s line of luxurious Turks & Caicos villas, HG HAR is surreal in its beauty, both inside and out. Situated on a sprawling two acres with 200 feet of white sand beachfront, ocean views over Long Bay Beach can be enjoyed from nearly every room. Lush tropical gardens surround the property, adding to the splendor of this four bedroom luxury villa. Villa HG HAR comes with everything one needs for a relaxing Caribbean vacation, right down to the beach towels. With maid service six days a week and a house manager available 7 days a week, guests at Villa HG HAR are guaranteed to be well taken care of during their stay. The villa also features a vast Tuscan-style kitchen, perfect for those who love to cook or for those who want to be pampered by a hired personal chef. Guests at Villa HG HAR also receive the benefit of exclusive discounts at the award-winning Regent Spa, making the perfect Caribbean vacation all the more relaxing. What more could one want?